What do YOU do with your withering flower bouquets? 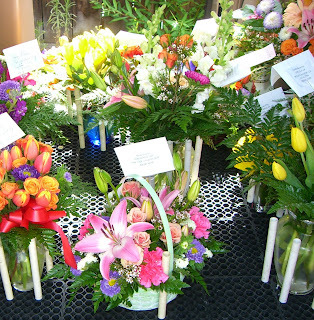 You received them on Mother's Day and they looked vibrant, alert, and full of color! But NOW....(sigh) they're beginning to lose their luster and a few of the weaker flowers have already bowed out of the game and hang limply in the vase. 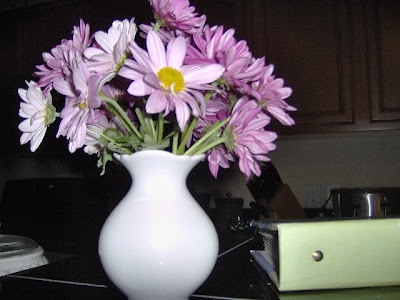 It crushes your heart to toss the cluster of probably pricey flowers in the trash . . .so don't! Pull out the tired, dead flowers and toss them. Then pull off some of the withering leaves on the rest. Re-cut the stems and group the flowers into 2 or 3 different mini bouquets. This is also an ideal time to get creative by finding things in your house to use as vases. 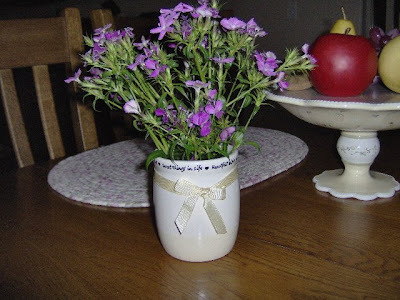 For example, in the photo below I used an old candle jar. I burned the candle out last fall, so I simply cleaned the wax out and made a vase. You have newly fresh cut flowers that add a completely different atmosphere to your home. Before, you had one regal, large, and stately bouquet to set front and center in your home. And now you have cute, little clusters of flowers scattered about your house giving a romantic, fresh, cottage-spring feeling to your home! Enjoy those flowers and savor the beauty in everything. One last note: If you don't have any fancy flower bouquet to makeover, it is still the perfect time of year to get outside and cut a variety of fresh flowers to use in your home sweet home! 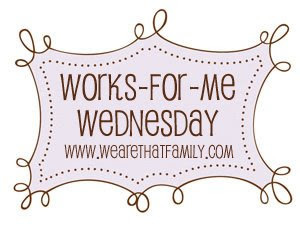 For more Works for Me Wednesday posts, click here. I this until I have 1 flower left! I love having fresh flowers in my home! By taking out only the most wilted and freshening the others, the "price per day" goes WAY down (if you're purchasing them)! Thanks for sharing- your little candle vase is so pretty. Flowers are SO expensive.. it's so sad when they die. Good tip! I just tossed out my last fresh flowers, but I will remember this next time. I'll also be on the lookout on what I can repurpose into small bud vases. i just throw them out cause flowers are teh devil!! my allergy's hate them.